Jobs Description: Visit our site to check Elysian Higher Secondary School Jobs December 2018. Elysian Higher Secondary School is situated in Gilgit Baltistan. Gilgit Baltistan is the most beautiful province of Pakistan. 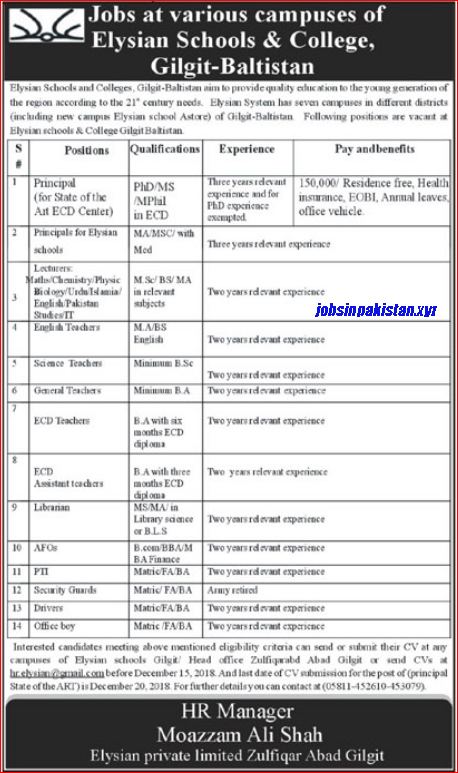 Elysian Higher Secondary School recently announced an advertisement for Jobs at various campuses of Gilgit Baltistan. Elysian Higher Secondary School has required the applications for following jobs. How To Apply: The interested candidates may submit their application forms to Elysian Higher Secondary School Head office or send their C.Vs to the given email address in the advertisement.